The Rottweiler is one of the oldest domestic dog breeds around. Originating in Germany, the history of this beloved dog breed goes all the way back to 70 A.D. Centuries later, it has become what we know today as the Rottweiler. The Rottweiler is considered to be a dog breed that is medium to large in size and in accordance to the FCI standard, it should be 61 to 69 cm in height. On the other hand, a female Rottweiler should be 56 to 63 cm tall. When it comes to weight, the average Rottweiler should be 110 to 132 lbs. if it is a male. For female Rotts, they should weigh between 77 to 105 lbs. Weight and height should be relative to one another. Moving on to temperament and disposition, a Rottweiler is generally good-natured, composed, loyal, obedient and hardworking. It has a natural physical appearance and it is confident, sure and courageous in its behaviour. It is not uncommon for Rottweilers to be kept as guard dogs in many homes as they are a very alert dog breed. It is also a known fact that Rottweilers like to take their time when warming up to new company – whether dogs or humans and they have the tendency to be aloof. Rottweilers will go to extremes to defend its home and family. They are used to working hard and are an excellent choice for either a companion or guardian dog. While undeniably there are records of dangerous behaviour in Rottweilers, typically this is a result of neglected, abused, or ill-training and socialisation. Rottweilers are not lacking in the strength department and this is why it is absolutely critical that they are trained and socialised in ample measure. With all of the above in mind, what steps can you take in order to ensure that your Rottweiler doesn’t act or behave badly? How can you help it to develop good habits and a pleasant demeanour that makes it an asset both to your home and to the animal community? How To Keep Your Rottweiler Happy? One way that you can aid in the proper training and socialisation of your Rottweiler is by providing it with several outdoor activities that it can engage in. Why? What is the benefit of doing so? There are numerous benefits of allowing your dog to step outside and get some fresh air and exercise. Before anything else, remember that dogs were originally bred to work. This means that it is in naturally implanted in their genetics for them to move around, work hard, and exercise their muscles. So don’t feel like you are obligating your dog to move, it would be far more cruel not to offer it a chance to do so. Sadly, this is a very common problem with the modern day dog. Most pet owners are so busy that they fail to correct the sedentary lifestyle of their dogs. The dogs are spoon fed with food that they don’t have to scavenge or hunt for and they are allowed or even encouraged to lie around the house, unstimulated. This leads to a fat, bored and unhealthy dog. This needs to be avoided in particular with Rottweilers considering that once again, they are a breed that was never intended to be idle or to be kept for mere companionship. It will alleviate a slew of common behavioural problems in dogs such as digging, hyperactivity, chewing and barking. It will enhance your Rottweiler’s immune system as it becomes more agile and limber. Digestive and constipation problems will be decreased. Timid and fearful dogs will learn to become more confident and trusting of themselves and of the world and the people around them. Better sleep quality for your Rottweiler as opposed to restlessness or heightened energy especially when you want to relax. It will keep your Rottweiler’s weight in check. What Activities Do We Recommend? Fetch — Whether you are using a baseball, a stick of wood, or anything safe for your Rottweiler to have in its mouth, there’s nothing quite like a game of fetch to get those physical juices flowing for your canine. The bigger the stretch of the land that you use, the more fun and exciting, and the more physically beneficial as well. 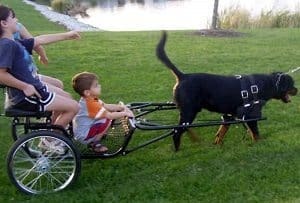 Walking — If you are leaning towards an outdoor activity that’s got something in it for you as well, then why not simply walk your Rottweiler outside? This will allow the both of you to explore the sights and sounds around you and get some physical exercise in while you’re at it. Half an hour should suffice. Twice a day wouldn’t hurt either. Be sure to use a leash that can adequately keep a hold on your dog for its safety and the safety of everyone around it. Hiking — This is the quintessential activity for your pet Rottweiler if you feel that you need to up the challenge when it comes to its physical activity level. It will be pushed to the limit and likely enjoy the challenge of climbing farther and climbing higher. Be sure to bring your dog’s water and dish to prevent dehydration, especially if it’s a warm day. 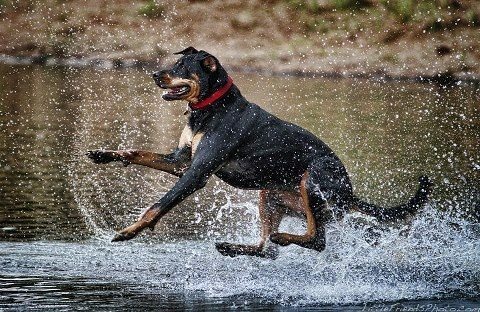 Swimming — If it is warm where you are or if you live by the beach, swimming is a great outdoor activity for your Rottweiler and it will surely enjoy the experience. You can even purchase a vest for your dog if you don’t feel comfortable with the idea. Be sure to bathe your dog thoroughly with its soap and shampoo afterwards. Hello My husband and myself bought a Female Rotti 2 months ago. She is a wonderful amazing girl. Lots and Lots of work and training. I wish I would have found this site a while ago. Hey Tammy thanks for stopping by! Glad you’re having a good time browsing through my site.